Carpal tunnel syndrome is related to compression of the median nerve as it travels through the carpal tunnel space in the wrist. Scar tissue/adhesions may create tension and irritation of the nerve as it passes through the space. The median nerve can be compressed above the carpal tunnel space by tension in the forearm, shoulder and neck as well. ART and FR can be a very successful techniques for treating carpal tunnel syndrome (CTS). Using these techniques the chiropractors are able to find the specific tissues that are restricted, and then physically work them back to their normal texture and tension. The hands-on methodology releases the median nerve from its abnormal attachments to the muscles, tendons, ligaments, or connective structures that are causing the nerve compression syndrome. Once the areas of restriction have been located, ART and FR procedures can be used to release the areas of nerve entrapment. During the treatment, the practitioner will move the arm/wrist or shoulder in the appropriate directions in order to stimulate realignment of scar tissue and reduce tension in the tissues. All of the chiropractors at Mountain Health & Performance utilize either ART or FR to treat patients with carpal tunnel syndrome. Repetitive shoulder, arm, wrist and hand movements may cause strain on the soft-tissues and joints in the upper limb. This repetitive strain can lead to muscle tension and scar tissue formation over time. 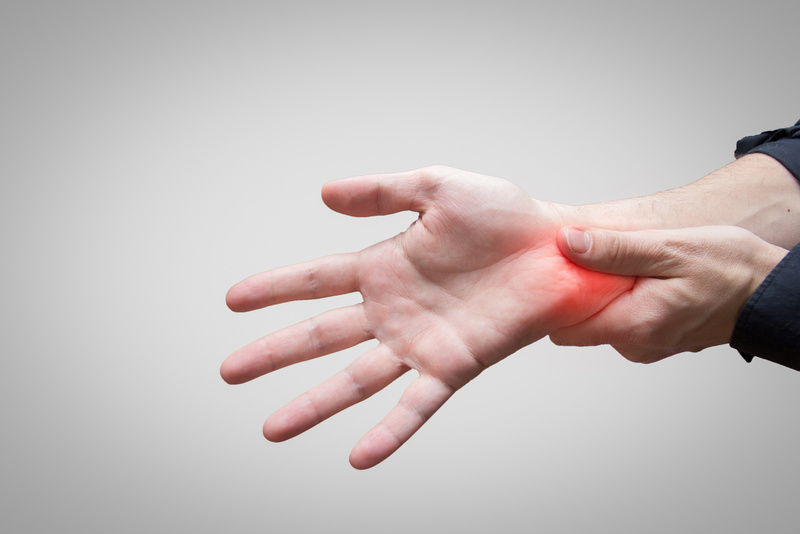 Carpal Tunnel Syndrome may be related to repetitive strain so it’s important to give the body a chance to rest for a period of time in order to break the repetitive strain cycle. The following positions/activities may be contributing to your carpal tunnel syndrome. Please try to avoid or limit these activities in the initial stages of carpal tunnel syndrome. Repetitive motion of the wrist and fingers i.e. : keyboarding, mousing, cleaning. Prolonged vibration: i.e. : using power tools. Prolonged position of the wrist in flexion or extension or extreme wrist bending (forward or backward) when grasping objects. Prolonged pressure on wrist during keyboarding, biking etc. Some studies have found significant improvement in carpal tunnel symptoms after patients wore supportive wrist splints full time for a 4-week period. Other studies have found benefits utilizing splinting for up to 12 weeks. Carpal tunnel splints can be purchased from most drug stores. Kinesiology taping helps to reduce the pain, swelling, and inflammation associated with carpal tunnel syndrome. When kinesiotape is applied to the wrist, it gently lifts the skin, reducing pressure on the underlying structures. It interacts with both the nervous system to provide pain relief and the lymphatic system to reduce swelling and inflammation. 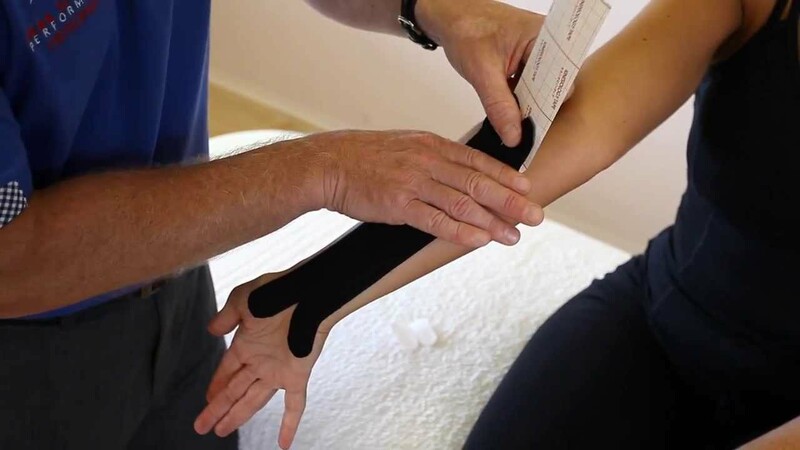 Because kinesiology tape is lightweight and elastic, it is comfortable to wear and still allows full range of movement of the wrist and hand, unlike many bulky carpal tunnel braces and supports. The chiropractors at Mountain Health & Performance utilize kinesiotape for carpal tunnel syndrome treatment. Research suggests that laser therapy can improve: pain, grip strength, function and nerve firing. Carpal tunnel syndrome is related to mechanical compression on the median nerve but may also be related to the build up of inflammaotry cells and issues with blood flow to the nerves. Laser therapy aims to stimulate chemically damaged cells via specific wavelengths of light. When cells are chemically damaged, they stimulate the chemical pain cycle. Laser excites the kinetic energy within cells by transmitting healing stimuli known as photons. Once photons reach the cells of the body, they promote a cascade of cellular activities. 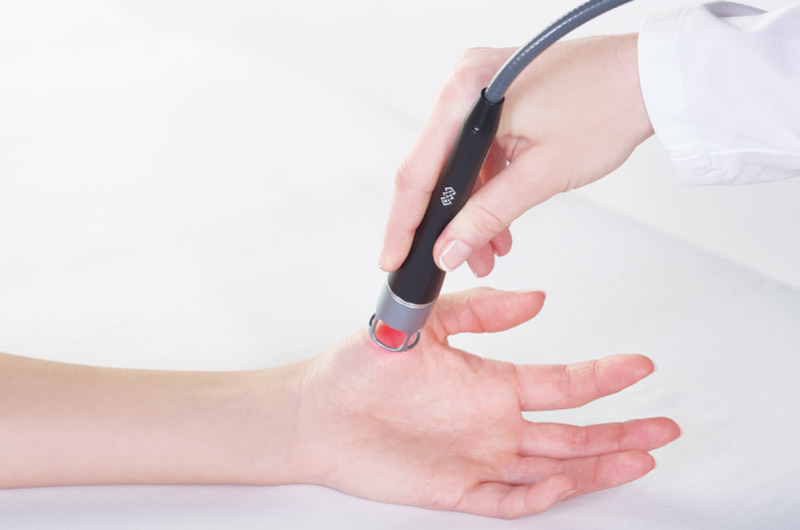 Laser therapy light can ignite the production of enzymes, stimulate cellular mitochondria, increase dilation of blood vessels and lymphatic drainage, promote production of cellular energy, and increase collagen formation substances to prevent the formation of scar tissues. At Mountain Health & Performance we don’t use laser therapy as a stand alone treatment but as a part of a comprehensive treatment plan to target all aspects of carpal tunnel healing. There is evidence to suggest that carpal tunnel syndrome involves reduced gliding and motion of the median nerve in the carpal tunnel, abnormal strain on the nerve and possible adhesions (scar tissue) around the nerves. This may put excess tension/strain on the nerve and cause some of the symptoms associated with carpal tunnel syndrome. Nerve flossing exercises that consist of active and passive movements are often helpful in reducing symptoms and improving wrist and arm function. At Mountain Health & Performance we teach specific nerve gliding exercises based on the involved nerve and stage of injury.